Urgency works in fundraising, but no one was providing that mechanism to social change projects … One of the real blockages in that space was of course the challenge of getting early stage funding. That was all controlled by a small number of gatekeepers, and you could only get in the game if you had a certain type of legal structure … All of this leaves an enormous amount of innovation on the side. 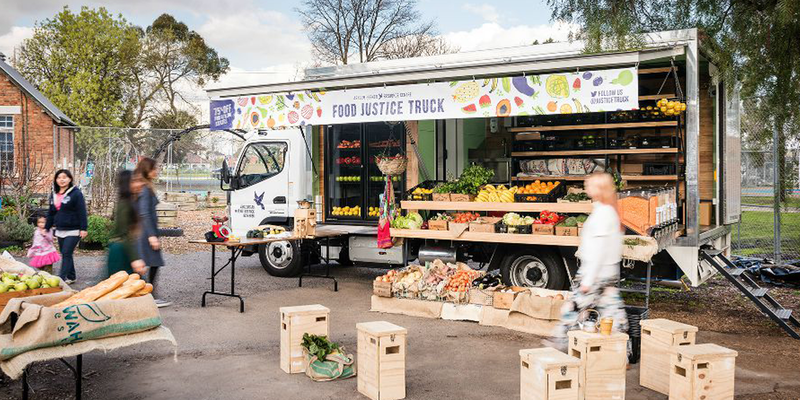 Pictured: The Food Justice Truck, an award-winning, mobile fresh food market that enhances food security for people seeking asylum in the Victorian community by offering locally sourced produce at a 75% discount to people seeking asylum. The FJT was launched by the Asylum Seeker Resource Centre using StartSomeGood. Tom Dawkins recognised that doing good in the world came at a price – without a huge amount of funds, it’s difficult to become a registered and recognised non-profit or charity. For the thousands of small and as yet unproven social good projects, this is an issue. So he created StartedSomeGood, a crowdfunding platform for non-profits, social entrepreneurs and change makers who want to raise funds to kick their project off the ground. On this episode of People of Purpose, Tom Dawkins talks about the future of crowdfunding and capital raising as well as integrating busy startup life with family life and other priorities. Tom Dawkins is a serial social entrepreneur and the Australian co-founder of StartSomeGood. He previously founded award-winning Australia non-profit Vibewire and was the first Social Media Director at Ashoka. He has worked with numerous non-profits, associations and government entities to help them tell their stories and build community. He’s founded a film festival, opened Australia’s first co-working space and set-up a Burning Man Theme Camp with his wife Kate. They returned to Australia in 2012 after four years in the US in time for the birth of their first child, Bodhi.